IBS Intelligence - Blog: Life after Deutsche Bank split? Deutsche Bank is pondering the future of its retail operations and this might have significant implications for its IT landscape. A number of proposals are currently under discussion, which would see Deutsche Bank selling off its subsidiary, Postbank, and possibly its own branded retail banking business. According to Reuters, Deutsche Bank’s management favours the sale of Postbank but would prefer to keep its own retail banking unit. Both run core banking and payments software from SAP, with Postbank pioneering the systems and assisting with their development back in the early 2000s. The project was a difficult one, to say the least, and took considerably more time and resources than originally anticipated. Deposits Management (the deposits component of the SAP for Banking suite) and Payments Engine are the result of this collaboration. Deutsche Bank also has a long history of using SAP solutions, via an outsourcing relationship with Postbank, until it acquired the latter in 2010. It signed with SAP to have its own implementation of Loans Management and Deposits Management systems in late 2009. Postbank has 1100 branches and 14 million clients, but Reuters predicts that finding a buyer is going to be a challenge, as the bank is among the least efficient retail banks in Germany, with a cost to income ratio of 81 per cent. According to investment bank, Jefferies, the retail banking division of Deutsche Bank is valued at around €4 billion (at a multiple of 0.4 times its book value within the group). Reuters describes it as ‘one of the lowest-valued retail operations in Europe’. But even if the entire retail business was shed, Deutsche Bank would still be facing major cost cutting if it wants to increase efficiency and decrease funding and capital requirements. 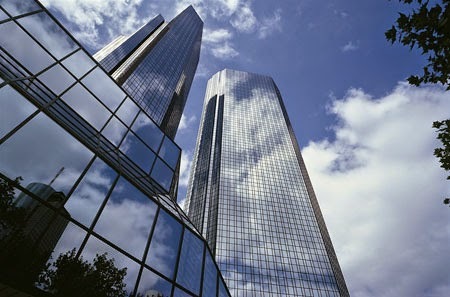 Analysts predict that a further reduction of the bank’s asset base would still be needed, by a whopping €100 billion.